The South Rwensori Diocese has an evangelism department that is tightly integrated into our greater long-term mission of serving the community. Uganda is a predominantly Christian country, but is also home to minorities of other faiths. SRD values healthy relationships with all of our neighbours, and seeks to be the image of Christ to followers of other religions, atheists, and other Christians through day-to-day demonstrations of love and holiness. This social awareness, as well as the example of Jesus, means we are committed to non-coercive evangelism. While we recognize and denounce all ideological extremism, particularly that resulting in violence, we also understand that the vast majority of Muslims are not extremists. We do not want to represent all followers of Islam as identical, just as we do not wish to be identified with Christians that choose violence and hate over the path of Jesus. Miraculous transformation in hearts is the work of our Father God, not us. Since Islam is the largest religion in Uganda after Christianity, SRD focuses a great deal of evangelical strategy on reaching our Muslim neighbours. Outreach includes workshops on theology, but involve far more than this due to the frequency of Muslim communities alienating converts. Muslim background believers have the opportunity to receive training and material support in establishing a new life and career if they are cut off from their old community. 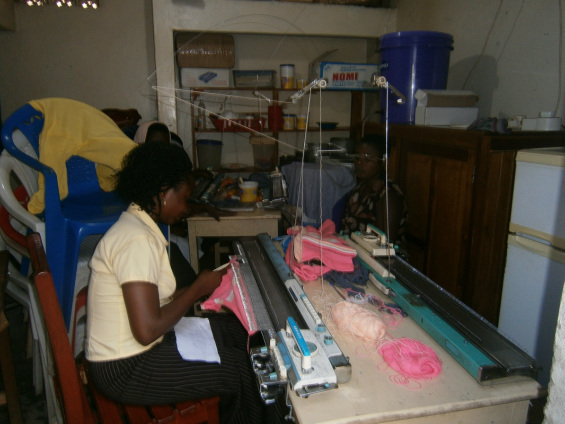 (including young mothers) are taught vocational skills including knitting, tailoring, cooking and computing. 100 library books from international book aid reading materials through Kyambogo University, Kampala. Graduation ceremonies of learners at the Centre have taken place. A new building with more space now houses tailoring and knitting facilities and hairdressing, computing and catering tuition is soon to move there, enabling more students to be accommodated. 1. Pray that finances will be forthcoming for the completion of the started classroom and office block at the Kasese Women Learning Centre. 2. Pray that all factors will work for power to be installed at our learning centre near the cathedral. 3. Pray that the 5m Ush needed for the repairs to a 15 year old Mothers’ Union office car will be secured or a capacity to purchase a new one. 4. Mother’s Department wants to begin the project of making weifers/ hosteirs for the Diocese and other Dioceses. 5. Retreat for clergy, lay readers and their spouses. 6. Address the issues on mortality rate which is so rampant in the diocese. 7. Address issues on gender based violence in the communities. 8. More equipment at the learning centre especially for hair dressing / saloon, and computers for training. 9. A computer for MU office. Messiah Radio 97.5FM was the first Christian radio that hit the air in Kasese district. The move to start the radio was developed by South Rwenzori Diocese and was finally translated into action in 1998. There was a need for educating the public about general health promotion, disease prevention, poverty eradication, peace, justice and reconciliation, environmental protection, modernization of agriculture, fight against illiteracy and other social economic development issues, and ultimately the word of God. To proclaim the good news of the gospel of Jesus Christ so that people of all walks of life may come to know him as their personal saviour and in turn make him known to others. In order to achieve the above mission, South Rwenzori Diocese set out a number of objectives. To proclaim the gospel in its purity and power. To provide Christian entertainment and serve as a medium of communication. To raise revenue for the sustaining and expansion of the broadcasting ministry. Messiah Radio has been working hard to make sure that the signals and broadcasting services are improved. This was partly achieved with the partnership agreement that was signed between Kasese district local government and the radio. This partnership addressed a number of issues that ranged from expansion of broadcasting coverage, procurement of radio equipment, construction of two masts and a transmitter house to cover the whole region of western Uganda. This partnership with the district saw the radio station having expanded its coverage to the entire region of western Uganda and the eastern democratic republic of Congo which has been hit by many conflicts and diseases. The communities in western Uganda and eastern democratic republic of Congo had limited access to information that would mobilize the masses to fight diseases and poverty, and proclaim peace and reconciliation, as well as promoting cross border trade. DRC having had many conflicts, the radio has been and continues to be a channel for peace-building and economic empowerment for the people in the region. However, with the completion of the above developments, there are still other gaps/ challenges that the radio station needs to address for it to have sound signals and better broadcasting services in the region. Advertisements and sponsored programs raise funds for sustaining and maintaining of the radio ministry and catering for staff remuneration.